Physician assistants (PA) are health professionals who practice medicine as members of a team with their supervising physicians. PAs deliver a broad range of medical and surgical services to diverse populations in rural and urban settings. As part of their comprehensive responsibilities, PAs conduct physical exams, diagnose and treat illnesses, order and interpret tests, counsel on preventive health care, assist in surgery, and prescribe medications. PAs promote quality, cost effective medical care to all members of society. 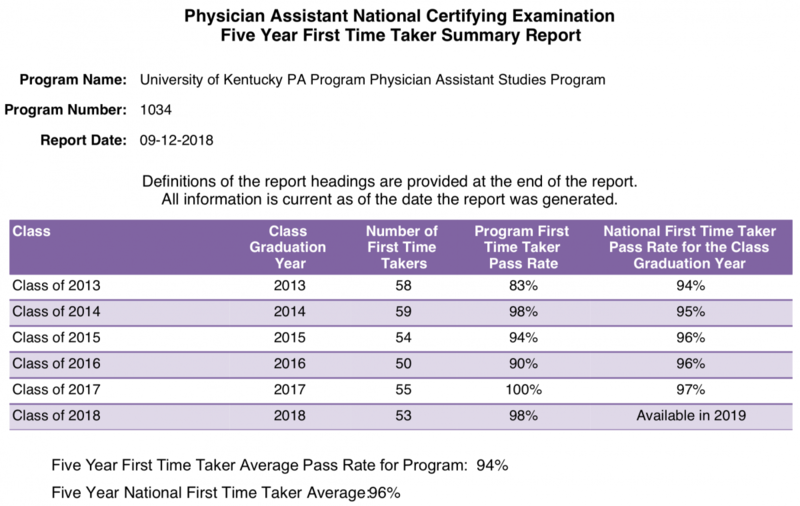 Physician assistants are certified by the National Commission on Certification of Physician Assistants (NCCPA) and state-licensed. How do PA graduates become eligible to practice? Physician Assistant Studies graduates are eligible to take the Physician Assistant National Certifying Examination. After successful completion of the examination, they are eligible for state certification and licensure to practice as certified physician assistants. The University of Kentucky PAS Program has two campuses: the Lexington campus is located in the Charles T. Wethington Building at the University of Kentucky and the Morehead Campus, which is housed in the Center for Health Education and Research (CHER Building) at Morehead State University. This document is subject to change due to changing tuition costs each academic year. You may check the University of Kentucky Registrar's website for the current tuition fees of the academic year. The UKPA program will update the tuition and fee document for each new incoming cohort before matriculation in January.